dog trainer specialist, I will share with you how dogs express themselves if they think play is too rough. I will also open your eyes to fearful dogs and the body language signs they offer. By better understanding those cues you can help your dog get out of stressful situations that may be creating your dog to be fearful. 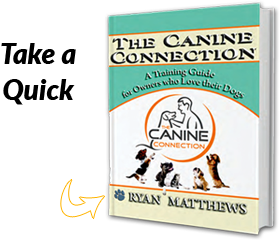 In reading your dog’s body language you can always know what is going on inside their mind. Now that is powerful, your dog will be forever grateful to you for further understanding them. Correcting : Correction is part of dog interaction. However, not all canines pick up on the point the other dog is trying to get across. A proper dog correction should be done once. If the other canine does not respond to the correction; it wasn’t done strictly enough. In fact, I have found that a weak reprimand often results in the other dog pushing the limit. If your dog is the one that is not picking up on the idea that it is being corrected for a particular behavior, then it is fine to step in and discourage the annoying behavior that is warranting a correction from an opposing dog. Some of the ways in which a canine reprimands another dog are: a lip curl, C-shaped lips, teeth bearing, growl or large dilated eyes. A typical healthy response from the dog being corrected is to offer some sort of acknowledgement signal such as a look away, tongue flick, ears pinned back or blinking. Correcting: Notice the Malinois’ ears are pinned back and he is offering a tongue flick with a low tail, saying he is uncomfortable. The white dog persists to mount and the Malinois makes a harsh and quick correction. 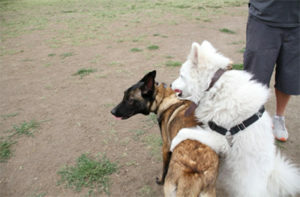 In this situation, once the white dog ceased the mounting, the Malinois carried on like nothing happened. Fear : Fear can also be a dangerous thing, especially if not picked up on by the dog’s handler/owner. A fearful canine is pretty easy to spot when the dog is in full fearful mode. However, to save the dog stress and hard times, pet owners must learn to identify the beginning signs of fear. Some of the ways in which a dog displays fear are: low tail (sometimes between legs) low rear legs with a majority of weight held there, pinned ears and wide dilated pupils. 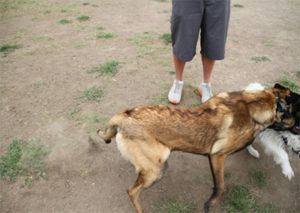 Fear: The dog on the left has braced legs and a tense body. 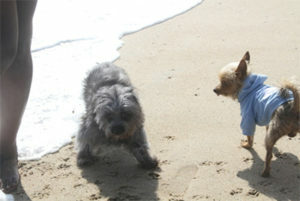 He is likely cautious and fearful due to the other dog along with the water. He feels trapped. Of all the personality traits that dogs possess fearfulness is one that is the most important that the owners are able to recognize when fearful dog is feeling uneasy. Body language signs of a fearful dog are easy to recognize. 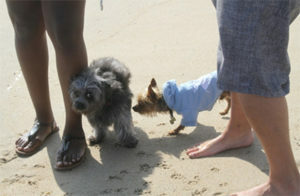 Despite that dog owners of timid/fearful dogs don’t step in when they need to. Essentially, if you see your dog is acting fearful remove them from the situation or at minimum change up the environment. If you do not help you dog out they will likely go into fight or flight mode. If flight is not an option due to being in a confined area a fearful dog may lash out and bit as a last resort. I find that all dogs will offer signals prior to biting or lunging. But, many times body language cues are ignored by their owners, other people or dogs that lack social skills (ability to recognize cues.) For dog’s sake, please step in when your dog is overly stressed and in fear mode.